An official of UBS AG on Wednesday will face questions from a Senate panel for the first time since Switzerland's biggest bank formally acknowledged responsibility for helping tens of thousands of American clients hide assets from the U.S. government. In a cross-border battle, the Internal Revenue Service is trying to pry from UBS the names of as many as 52,000 wealthy Americans who maintain secret accounts with UBS. The bank maintains that turning over the account names would violate Swiss privacy law and jeopardize UBS' license to stay in business. The Swiss government - which is providing financial support to UBS as it struggles with massive losses stemming from the U.S. subprime mortgage crisis - has refused to send a representative to Wednesday's Senate subcommittee hearing, in protest of the IRS lawsuit against the bank. Cloak-and-dagger tactics said by the U.S. government to have been employed by UBS - coded language in internal e-mails and memos, foreign shell companies and phony charitable trusts, use of pay phones and foreign area codes and credit cards - will be on display at the hearing, which starts at 2:30 p.m. EST. UBS allegedly staged training sessions so that "client advisers" could travel frequently to the U.S. - on average 30 days a year each - to consult with secret U.S. customers without attracting the attention of tax agents or law enforcement officials. The advisers were told to rotate the hotels they stayed in and to "protect the banking secrecy" if they were questioned by any authorities, according to excerpts of UBS internal documents filed in the IRS suit and provided by the subcommittee. The dispute has prompted heated debate in Switzerland over the country's cherished banking secrecy, a tradition that has helped transform the nation into one of the world's richest. The investigative panel of the Senate Homeland Security and Governmental Affairs Committee, led by Sen. Carl Levin, D-Mich., is voicing outrage at what it says is obstruction of the U.S. government by both UBS and the Swiss. Levin said Tuesday the panel hopes to learn from UBS official Mark Branson the exact number of American account holders. Branson is the chief financial officer of the bank's global wealth management and Swiss bank division, based in Zurich. "We've been stymied," Levin told reporters. "These are abuses that are unconscionable." Now that UBS has acknowledged "participating in a scheme to defraud the United States government and its agency, the IRS," the bank rightfully should turn over the names of American clients, Levin said. 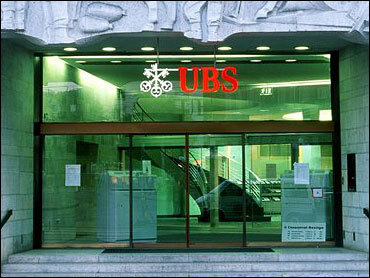 Karina Byrne, a UBS spokeswoman in New York, declined to comment. UBS on Feb. 18 agreed to pay a hefty $780 million in fines and restitution for conspiring to help American citizens violate their country's tax laws by hiding assets - estimated to be worth at least $14.8 billion - from the U.S. government. In the deal struck in federal court in Fort Lauderdale, Fla., the Justice Department agreed to defer criminal prosecution of UBS in exchange for the payment of fines and restitution, and the names of up to 300 U.S. clients. The bank says it has shut down the improper foreign-account business, and taken corrective measures to tighten its compliance and internal control systems. The agreement didn't cover the much broader list of as many as 52,000 customer names now sought by the IRS, but both sides knew the U.S. government would ask for them. In its civil suit against UBS, the IRS has asked a federal judge to enforce so-called "John Doe summonses" seeking information about the Americans' accounts. Another federal judge approved the summonses in July 2008, but UBS never complied. By providing the 300 or so names, the bank says, it has complied with the summonses as fully as it can without violating Swiss law. Wednesday's hearing is the latest in an extensive series by the Senate panel examining offshore tax abuse, which is estimated to cost the United States $100 billion a year in lost tax revenue. Recovering tax revenue has taken on amplified urgency amid the economic crisis, when the federal deficit is expected to balloon to nearly four times the highest level in history as hundreds of billions of dollars are spent on the bailout for financial institutions and the economic stimulus plan. Also testifying will be IRS Commissioner Douglas Shulman, who has warned U.S. taxpayers hiding money overseas that it was time to come clean with the agency. "People who have hidden unreported income offshore need to get right with their government. They should come forward and take advantage of our voluntary disclosure process," Shulman said last month. On Tuesday, Treasury Secretary Timothy Geithner said President Obama supported legislation authored by Levin that would tighten U.S. tax laws and close loopholes to fight offshore tax-haven abuses. The president's support "greatly improves the chances of an offshore tax bill becoming law this year ... (and) sends a strong signal to tax havens that this administration is not going to tolerate the kind of offshore tax abuses that have been draining" the Treasury, Levin said.